The Shar Pei originated in China along with many typical names found among the breed. A few common Chinese dog names are Satsuki, Yanlin, and Mei Ling. ‘Sand Skin’ is a rough translation of Shar Pei. Along with this theme, some desert inspired ideas include Sahara, Sinai, Mojave, and Monte. The Shar Pei is well-known for its loose skin that is thought to be an adaptation to an early role in boar hunts. Some characteristic skin related names are Furrow, Wrinkles, and Brow. A blue colored tongue is another notable feature found among the breed. People can achieve a similar tongue-color through the consumption of certain sweets. Some sugary treat inspired names are Candy, Wonka, and Taffy. Some of our pages will contain a subcategory. A subcategory is a slightly more specific grouping than the main topic of the page. For a subcategory, we will include a separated table of names and corresponding descriptions. An example of a subcategory of Red Dog Names would be 'Dog Names Inspired by Red Wines'. 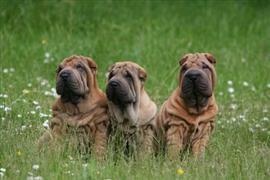 If you have any subcategory ideas for the Shar Pei Names page, we would love to hear them. Use the form below to submit your ideas.